Without customer service measures in place, visitors to your store might leave without making a purchase. By placing shopper call buttons in strategic locations (see list of locations here), retailers realize a low-cost, fast and efficient way to maximize customer satisfaction. When an interested customer presses a simple button to request assistance, radio equipped store staff are notified instantly. Responding to customer requests for face-to-face interaction is a proven way to enable customers to make a positive buying decision. In fact, research has shown that of those who need help making up their mind, 93% can’t find the right person to help them, and 90% will leave the store empty-handed. Face-to-face interaction was critical to the decision to make a purchase, according to Chain Store Age. Therefore, it makes sense to employ the use of the Ritron Quick Assist Shopper Call Button anywhere more complex products are traditionally displayed that may require some face-to-face interaction. 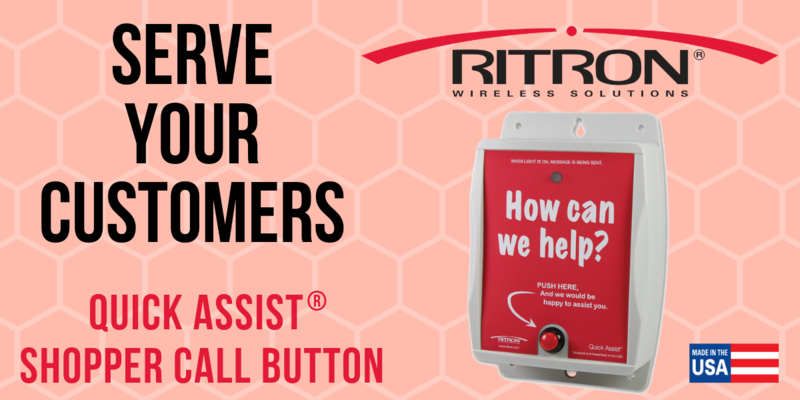 We have found our customers reporting that the levels of employee productivity have increased when using the Ritron Quick Assist Shopper Call Button. How so? As levels of customer traffic ebb, managers may assign a single employee to cover multiple departments. With a strategically placed shopper call button, one radio-equipped employee can respond to customer service inquiries in one department while performing re-stocking duties in another, for instance. All Ritron products are field programmable. Find user manuals with complete instructions here, and for PC programmable products, find software information here.